Hoodoo Butte pictures - 2019 04/25 (Thu) 19:38 - Mobile page - Weather page - 48 hour, 6 hour versions Use REFRESH in your browser to force updating views stored in cache. See the full Pictures page for details on what views are updated after sunset. 645' - US20 Milepost 31 - Sweet Home / Foster Res. To: Hoodoo Ski Area's main page. At various places on and around Hoodoo Butte there are cameras with views of the local mountains or other features of interest. The primary reason for having cameras is to allow the Ski Patrol radio dispatcher to see what's happening at various places on the hill. The tops of the chair lifts are of particular interest to them. 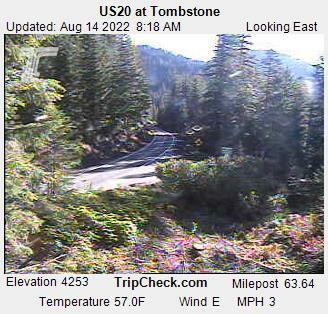 Additional cameras have been added to help weather station users understand the current local weather conditions. These views attempt to include items both near and far, so that conditions can be better understood in the event of reduced visibility. Some cameras were added for the view on a clear day. Clouds may obscure views from higher or lower camera sites under different conditions, so the redundant views of various mountains in the background can be useful to understand where cloud deck tops and bottoms are located. Camera locations are constrained by power and communication resources, and year-round usefulness. Opportunities are limited, but interesting views will be added where possible. Hogg Rock is a "tuya"
Hayrick Butte is a "tuya"
A new picture is taken every six minutes. - This web page is updated every twelve minutes. Pictures will generally not be updated after twilight, after it gets too dark to get good pictures. - The sun is more than four degrees below the horizon. - Pictures of roads and parking areas will be updated at night, since this could be of use to late-night travelers. - Pictures of night skiing areas will be updated for days (Fri & Sat) and times (until 9PM) and dates when it's likely to be happening. When visibility is reduced by clouds, fog, or precipitation, here's what you might not be seeing (sorted by elevation). Views to the east and west are hard on the cameras. Since we want to have some portion of the sky in the picture, at some times of the year the camera will be pointed at a rising or setting sun. Base area camera - Between ~27 May and ~12 August, the evening sun. Easy Rider camera - During the short days of the year, the morning sun. 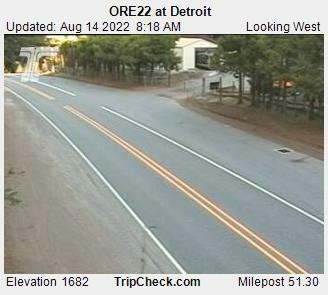 Anyone know of any other web cameras in the area ? 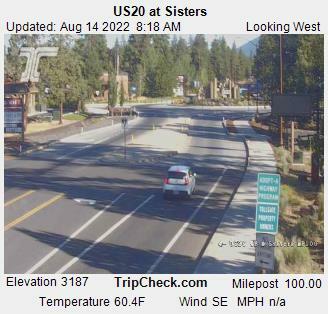 And maybe we can encourage folks in places like Clear Lake, or Suttle Lake to consider adding a camera to their web site. If you have ideas for improvements to this picture page, please Email them to " ". Please type the address shown into the "To:" line. This wierdness is explained in the "Spambot" comment on the main weather page. How this page is created. A map of the neighborhood. Cascade Volcano WebCams - Amar Andalkar's site with pictures of mountains from Mount Meager in Canada to Popocatépetl in Mexico. 2018 02/17 - For those who follow what's happening in this neighborhood . 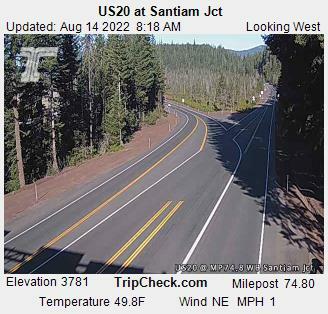 . . Santiam Lodge (located just across highway US20 from Hoodoo) may be re-opening to visitors. The official web site for Friends of Santiam Pass Ski Lodge invites you to learn about, follow, and maybe lend a hand in this restoration effort. You can also Google "Santiam Lodge" for other links about the lodge's history. 2018 12/23 - Night skiing related cameras will update until 9PM Thursday, Friday & Saturday evenings from mid-December to the end of March. These include cameras on the Manzanita, Easy Rider & 'Ed lifts, and the base area. If there is night skiing during these times, we will be able to see it. 2019 04/07 - Random shot #4 - Not what the birds were hunting alongside the road ... "Snow worms" can be found in the snowpack in the Spring. They avoid sunlight, retreat at twilight, and come to the surface in greater numbers when the snow is saturated with rain. Like, but probably different from "ice worms" which are said to only live in glaciers.